During the fall leading up to her bat mitzvah, Tara (Hindi for “star”) Feinstein has a lot more than her Torah portion on her mind. Between Hebrew school and study sessions with the rabbi, there doesn’t seem to be enough time to hang out with her best friend Ben-O—who might also be her boyfriend—and her other best friend, Rebecca, who’s getting a little too cozy with the snotty Sheila Rosenberg. Not to mention working on her robotics project with the class clown Ryan Berger, or figuring out what to do with a priceless heirloom sari that she accidentally ruined. 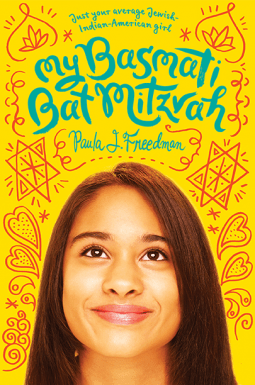 Amid all this drama, Tara considers how to balance her Indian and Jewish identities and what it means to have a bat mitzvah while questioning her faith. With the cross-cultural charm of Bend It Like Beckham, this delightful debut novel is a classic coming-of-age story and young romance with universal appeal.